New and even faster line-up of five high-fluor gliders. Three of these waxes debuted in our our extremely popular Racing Service Line. The HF11, HF21 and HF31 waxes really proved their performance in races, and have now earned their place as the successor to our previous HF line. The series grew by one new product, HF21 Graphite, which made the line cover all snow conditions. Enhanced formulas and new raw material discoveries have made it the leading glide wax line available, which of the continued use of the products among world class teams is a proof. The story of new HF series: From 25 different Sochi Olympic test waxes to 4 commercial products. The research and development of the new HF series began in collaboration with the Finnish National XC Ski team with a common goal: To make the ultimate HF glider for Sochi Olympics. We started with a blank canvas and completely new raw materials, and made 25 different test waxes that were tested with over 8.000 timed test runs in different conditions. Only the best waxes for each temperature range were chosen for production, and here they are! 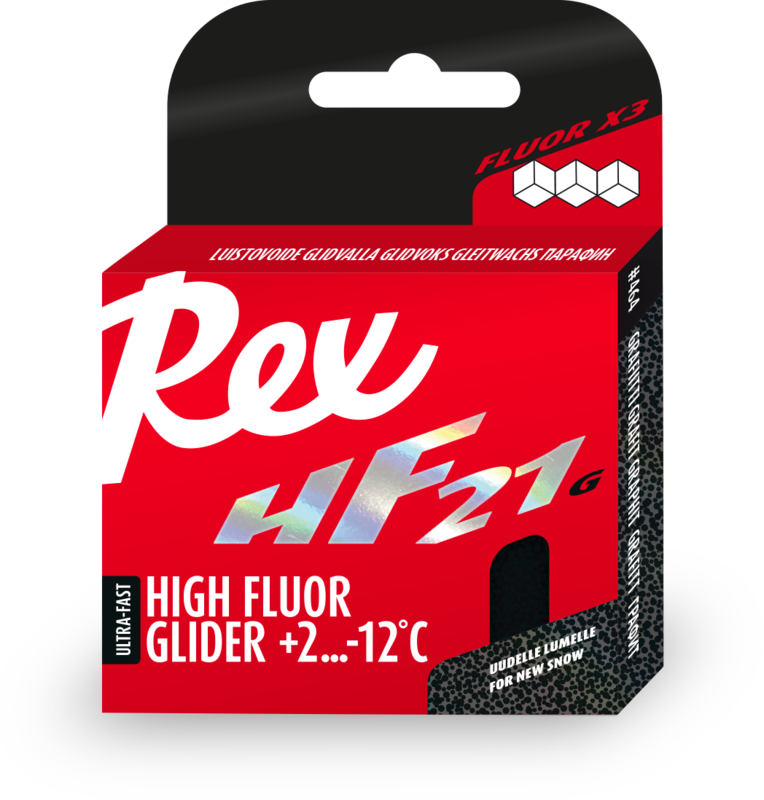 The new HF series is the first of new generation Rex gliders. For new and old snow. The softest wax on HF -series. Compared to traditional warm condition HF gliders, the HF11 is relatively hard and not so oily wax. Easy to apply and extremely dirt repellent. For all snow types. 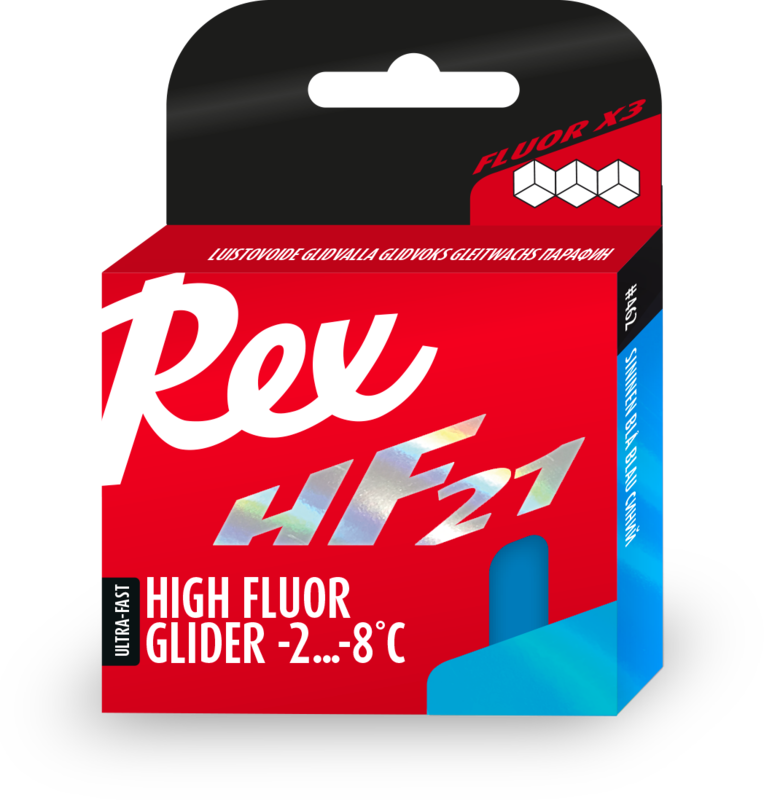 Developed for mild to medium frosts, the HF21 is our all time fastest HF glider! It is hard, but still easy to melt. Developed especially as an underlayer for fluoro powders, but works extremely well also as a final layer. For all snow types. Hard and very durable HF glider for cold conditions. Due to its hardness, it is very durable and abrasion resistant even in warmer conditions. A brand new wax in the extremely popular HF series. Engineered especially for new snow, containing a precisely defined amount of graphite. Hardness is positioned between HF11 Yellow and HF21 Blue. 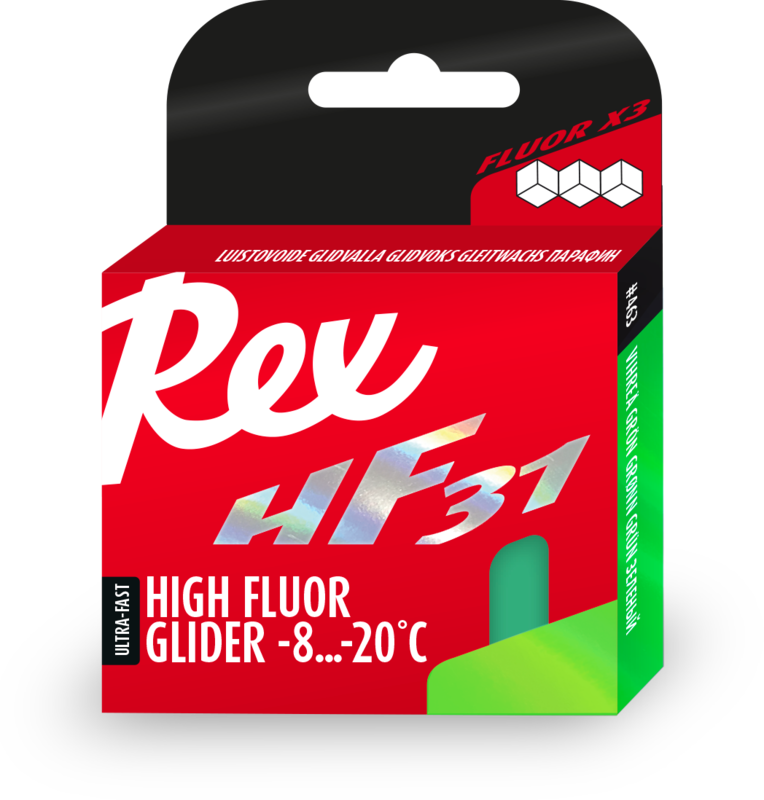 High fluor glider in powder form. Based on the same new raw materials as the highly acclaimed new HF-series. The powder form enables the mixture of the insoluble PTFE component into the product. Watch a video about HF Powder on our YouTube channel! World Cup level glide waxing performed by our racing service experts. Follow the instructions, and try out how fast your skis really can be!